There are many who, in search of once and future truths, make terrible errors. Among their failed rituals, their bodies twist and change. They become commanded by a will greater than their own, a being for whom no knowledge is considered forbidden. The Lurker at the Threshold is seeking a way to manipulate the world from outside space and time. Only the investigators can find a way to stop the dangerous machinations of Yog-Sothoth or else they may find themselves joining the ranks of the mindless servants arrayed against them. 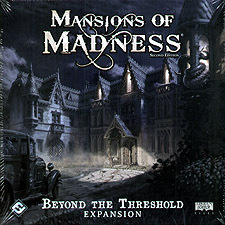 The Beyond the Threshold expansion includes new investigators, new tiles, a new monster, access to two new scenarios, and more, allowing the investigators to pit themselves against the all-knowing Yog-Sothoth.